Pot of Desires comes just short of the top spot in pojo’s card of the day top 10 list, which means you can probably guess tomorrow’s winner by now. I personally had Pot of Desires at #9, lower by 7 spots for two reasons: first this card’s future potential is extremely limited. Currently, those who can afford Pot run between 2-3 in tournament decks. However, once this card is inevitably limited to 1, literally everyone will run it without question. And like all pots before it, Desires will eventually be banned once it reaches the end of its tail, never to see the light of day again. But the second reason I have Pot of Desires so low is simply because of the cards I ranked higher than it. 2016 was a year without compare for Yu-Gi-Oh. In particular Breakers of Shadow is considered by many players to be a top 5 set all-time. Pot of Desires is definitely a game-changer, but a lot of cards in 2016 were. Making this list was pretty darn hard. I just happened to see some things my peers did not. So what else can be said about this little spell? Does it deserve to be #1? Well, it’s an argument that probably pulls people in different directions. On one hand, drawing two cards is king. Always has been. On the other hand, how many times has the spell quite literally destroyed the deck of its user? I’d wager there are millions of stories out there about this pot of bad luck. I guess perhaps the real question we should be asking is: Was Pot of Desires good for the game? To me, the answer is a resounding “no.” Just like Sixth Sense, it feels like Pot was released solely to sell cards, and I’ve never liked that feeling. So, in the end, I’m glad that Pot of Desires didn’t come out on top. I gave Pot of Desires a glowing review when it first came out and it was a controversy for some. Still, I'm going to admit I did that in a total a priori way. 2) Not all costs are equal. Drawbacks and barriers aren't the same thing. A drawback is a cost you can pay but may not be able to, and what's a drawback to some decks might not be to others. A barrier is something that prevents you from using it. Discarding, for example, is a barrier. But Pot of Desires doesn't tax you from your immediate resources so you can use it the second you draw it. All it needed was cards to capitalize on the banishing effect. I'm still giving it a 5/5. How could a -9 ever be good? If you said anything similar to the above sentence and you were serious, then you probably don’t understand how card advantage works, nor do you understand why Pot of Desires is not only a +1, but one of the best cards ever made. 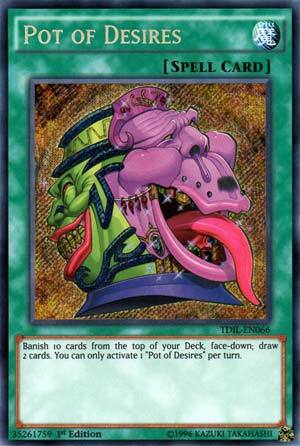 As I have stated above, I think Pot of Desires was the best card of the year, and one of the best cards ever made. I’m okay with it clocking in at #2 because I think the #1 card is also one of the best cards of the year and ever made. This card is Pot of Greed. Simple as that. You play it, you draw two cards, it’s a +1. It is Pot of Greed. Here’s the flaw in that logic. If you play Pot of Desires, you banish ten cards facedown, so you don’t have them. If you don’t play Pot of Desires, then you keep them in the Deck. In other words, you don’t have them. The game is so fast paced that those ten cards are likely not going to matter anyway. The only Decks that can’t use Pot of Desires are ones that want to keep specific cards in the Deck and/or are reliant on 1-of cards. I’d argue that actually makes it less balanced (but not better) than Pot of Greed; the latter at least can be used by any Deck in the history of the game. The same can’t be said for Pot of Desires. But I digress. A basically free +1 will never not be good, and that’s what Pot of Desires is. It’s very good, and is imo a banworthy card. Pot of Desire comes up just short of being the best of the best in 2016. Banishing 10 for a +1 after all is done still doesn't make much sense to me. Yes, you can look at the cards banished face-down and know what's left in your deck, and while you get two cards for the activation of your Pot of Desire, I feel the risk of banishing something useful is too high. I think of Lightsworns when I read this card, except Lightsworns still had access to the cards they milled. Not only that, but the cards you draw come after the banish. However, if you run a strategy that uses 3's of a number of cards, or run a strategy that can function without needing certain cards to be successful, this card may be for you. Also, there are some 60 card decks that could run a playset of this and be successful. A great card for many, too risky for others. Game-changing? Yes. Honestly, I expected Pot of Desires to come in at #1. This card is fun, because even though the "Draw 2 cards aspect" related here, this isn't necessarily going to be a card that generates you any advantage. It can be used and abused, absolutely, but there are times, too, where it's not going to do much for you other than give you the two cards from your Deck. (And remember, 10 cards, even if not lost forever, is a huge cost...and remember, these cards are removed face down, that's important too). This card is also likely to see Ban Land pretty soon I would imagine.